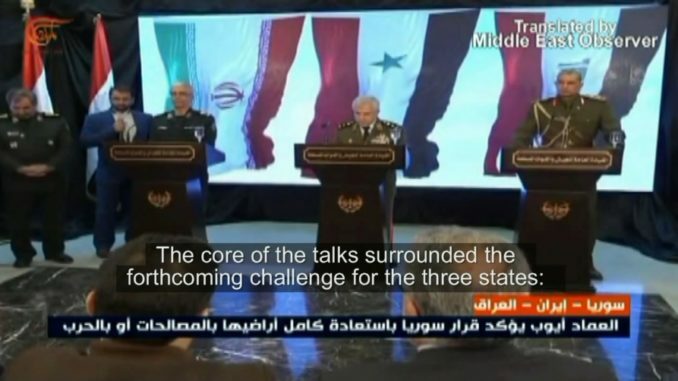 This video is a news report by the Beirut-based Al-Mayadeen Tv surrounding the trilateral military summit that brought together the heads of the Syrian, Iraqi and Iranian armies, which was held in the Syrian capital Damascus on 18/03/2019. While the stated aim of the summit was to boost joint efforts against terrorist groups in the region, many observers also see this summit as a sign of the growing political, military, and economic convergence of the so-called ‘Resistance Axis’ in the region. The ‘Resistance Axis’ broadly refers to a strategic anti-Israel/anti-US imperialism alliance composed of, but not limited to, Iran, Syria, Hezbollah, Iraq’s Hashed al-Shaabi, Yemen’s Ansarullah, and various Palestinian armed factions. The location: the Syrian Defence Ministry. Military talks between Syrian Defence Minister General Ali Ayyoub, Iraqi Chief of Staff Lieutenant General Othman al-Ghanimi, and Iranian Chief of Staff Mohammad al-Baqeri. The location of the meeting in Damascus is symbolic, after (the Syrian capital) exited from the furnace of dangers. The timing is symbolic as well, with Idlib, north Aleppo and east of the Euphrates today forming pressing files. Ali Ayyoub: The last remaining card in the hands of the Americans and their allies is QSD (the ‘Syrian Democratic Forces’), and it will be dealt with by the two methods used by the Syrian state: national reconciliation or the liberation of the areas that they control through force. The core of the talks surrounded the forthcoming challenge for the three states: the consolidation of security cooperation under a broad framework that is supported by measures on the ground aimed at opening up transportation and trade routes. Othman al-Ghanimi: The coming days will witness God willing, the opening of the border crossing and the continuation of visits and trade between the two countries (of Iraq & Syria). We have a joint committee formed for this purpose. As part of this cooperation, Iran renewed its support for Syria, in its efforts to retake control of its entire territory. Mohammad al-Baqeri: We stress on the need for respecting the sovereignty of Syrian land, and we reiterate our stand alongside the Syrian government in exerting its sovereignty over all of its territory. We also reiterate our opposition to any state entering Syrian land illegally. We entered (Syria) following an invitation by the Syrian side, and we will remain so long as the Syrian government requests this from us. The three states sent clear messages, that can be summarised as: ‘the rejection of all foreign intervention in their affairs and the beginning of new stages in the war against terrorism’, as well as ‘confronting the (political/economic) embargo via innovative methods’. The complete coordination between the armies of the three states formed a cornerstone in breaking the backbone of terrorist organisations. This coordination is of (crucial) importance today due to decisive files, especially the (issue) of Idlib and east of the Euphrates. Mohammad al-Khodor, from the Syrian Defence Ministry in Damascus, Al-Mayadeen (Tv).